My bras started getting too tight and were extremely uncomfortable. So I had figured that it was time to go shopping again to purchase some new ones. In the past I was able to buy Best Form all cotton bras in the old Walmart Stores. That's no longer true with the new Walmart Super Centers. My bras are still in very good condition and all I needed was an extra inch in the band width, so I found my answer on this website. I checked the price of a new bra extender and they cost $7-$9. So I went to the Salvation Army Store and purchased two bras. I don't mind used clothing, but I purchase all new underwear for myself. Wednesday is 50% off on all items at the Salvation Army. I mentioned to the clerk that I was buying the bras so I could cut off the hooks and eyes to make several bra extenders. So she only charged me $1.02 for both bras since I only needed the hooks and eyes. I was able to stitch the hooks and eyes together on my sewing machine, using a zigzag stitch. So the next time I have to purchase some new bras, I'll remember to cut off all the old hooks and eyes. I dont sew, but I do have double stick tape. Would that work? I don't think that double stick tape will hold up. If it didn't unstick right away, it would probably unstick as your body heats up the tape. Possibly fabric glue might work but it would be unfortunate for it to bust loose when you are out running errands or something. It's a very small amount of stitching. 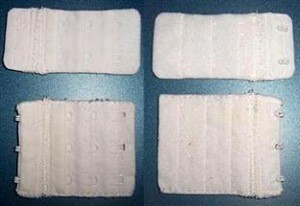 If you can't find a friend to sew for you, it might be better to purchase the ready-made bra extenders.